Autumn is a busy, social season teeming with holidays and parties. Ward off the cold and impress your guests with fall container plants! Look for easy to grow plants whose hues and shapes are appropriate for celebrating the season. Coral bells or heuchera are available in many colors and textures, so you’re sure to find a perfect one for your home. The heart-shaped, boldly-veined leaves of coral bells make a statement. Conveniently, there’s a variety of heuchera for every environment. Some prefer the sun while others prefer the shade. These are incredibly hardy fall flowers, which survive temperatures down to -25°F and act as perennials in zones 4-9. These mounding plants impress on their own and beside other similar or contrasting plants. Pair gourds, mums, and ornamental grasses with coral bells to bring out these fall favorites’ features. Varieties like “Dolce, Licorice” and “Dolce, Peach Melba” are easily incorporated into autumn decorations due to their appropriate coloring. A great see-through specimen, verbena makes an impact with its six foot tall willowy stems. These flowers come in a range of colors, including reds, blues, purples, and pinks, so you’re sure to discover the ideal plants for your garden planters, window boxes, and hanging baskets. Verbena is a resilient flower that’s planted in spring but will last until fall. You can get many weeks out of verbena, as it can withstand temperatures as low as 15°F as well as the first frost. Caring for verbena isn’t time-intensive; it’s drought-tolerant and only requires an average amount of water. To get verbena to last, you do need to provide it with good drainage and food every couple of weeks. Furthermore, verbena looks its best when it’s cut back after its blossoms have faded. An elegant and cheerful plant, oxalis is also known as the love plant and purple shamrock. Oxalis grows easily but prefers full shade or partial shade. This annual thrives throughout the fall until temperatures drop to below 15°F. At 12 to 18 inches tall, this mounding plant can fill out any container. Rich colors are perfect for fall, so seek out the dark “Charmed Velvet” and burgundy “Charmed Wine” varieties of oxalis. Cabbage and kale aren’t just for eating. These leafy greens also make for uniquely-shaped container plants in the fall. Chubby cabbage and spiky kale are stylish additions to containers, where their sage, pink, and purple leaves stand out from the crowd. Unlike most plants, these veggies’ colors only become more vibrant as it gets colder outside. Cabbage and kale are singular, statement-making plants that deserve creative containers and arrangements. Have fun experimenting with these plants while incorporating them into your decorations. Cabbages look lovely when grouped together in rustic containers and low baskets. If you have any trendy containers lying around, kale is the kind of bold plant that can fill them. Funky shallow containers and streamlined window boxes make good homes for kale. 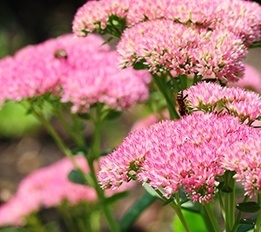 Sedum is also known as stonecrop because it can thrive in the least accommodating environments—even between stones. Creeping sedums look best in the fall, producing succulent leaves whose colors range from green to blue-gray to reddish bronze, and five-petaled flowers that come in yellow, white, and pink. As long as it gets enough drainage and sun, sedum will prosper. Sedum can actually be left outside all winter; the dried flowers look charming when peeking out from beneath the snow and frost. This perennial is a champion, outlasting temperatures as low as -40°F.